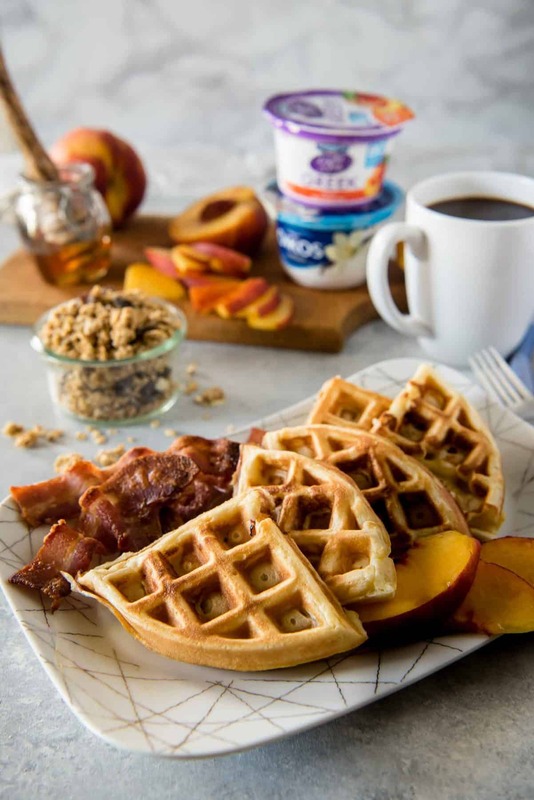 These deliciously easy Peach Cobbler Waffles with Honeyed Yogurt should be on your breakfast menu this weekend! 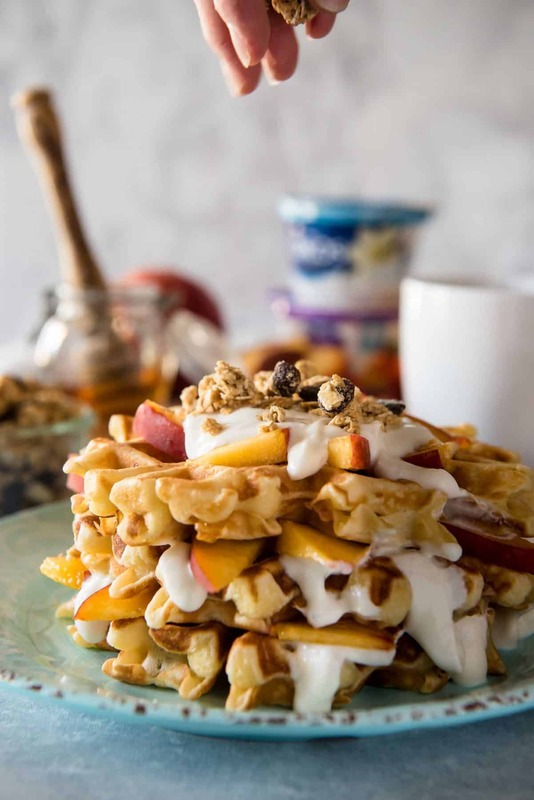 Buttermilk waffles, lightly sweetened with yogurt & fresh peaches, then stacked and topped with honeyed yogurt and granola – nothing says summer quite like these! This post has been sponsored Dannon. All thoughts and opinions are my own. What would you consider the greatest debate in all the food world? Chocolate vs. vanilla? Hot dog vs. hamburger? Chicago vs. New York-style pizza? Nah. I think it’s waffles vs. pancakes. 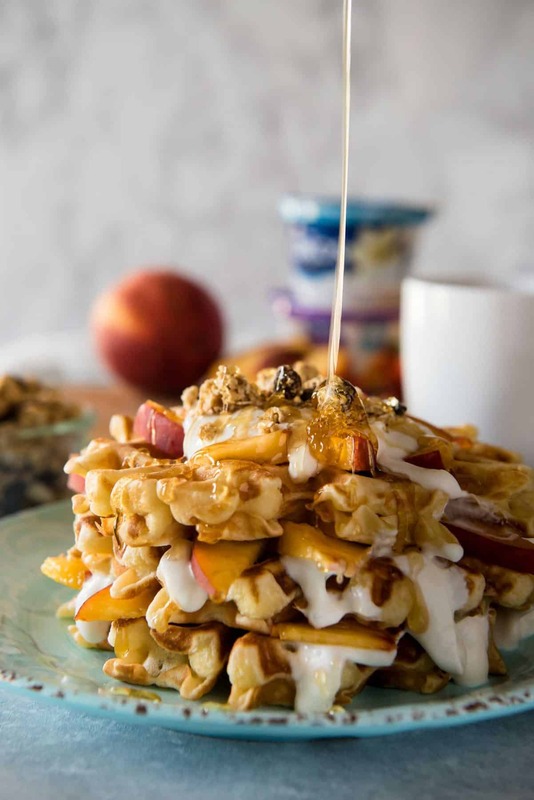 Personally, I normally fall into the French toast camp…but then I made these Peach Cobbler Waffles, and my whole world got flipped-turned upside down. Waffles are definitely the most photogenic of the three main breakfast options. Think about it. Pancakes are just round and flat (unless you have one of those weird pancake shaping silicon molds – and the only people that have those are moms of little kids.) They have literally one dimension. Drizzle on some syrup and it tumbles right off the edge. At least with French Toast, you’ve usually got a crust around the edge to hold in your toppings of choice. And there’s some texture thanks to whatever amazingly airy bread you use. And yet – one note. It always looks like a slice of bread, unless it’s chopped up in a casserole. And even if you decide not to fill the grid all the way to the edges, they’re still beautiful. Or a perfect drizzle of honey, in the case of these healthier guys. Waffles were part of plenty of mornings in my house during my childhood, but they were usually of the frozen sort. 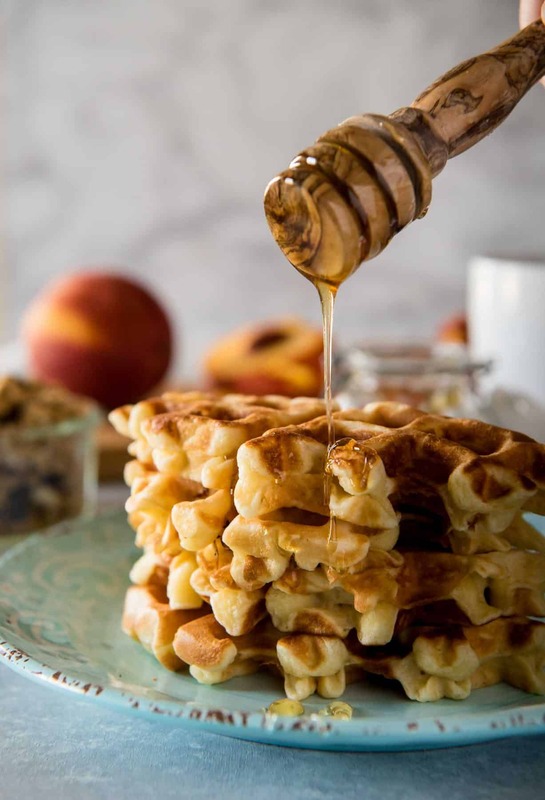 Let me tell you, though – making a big batch of homemade waffles, and digging them out of the freezer the next day because you just can’t get your mind off of them is a much better situation. 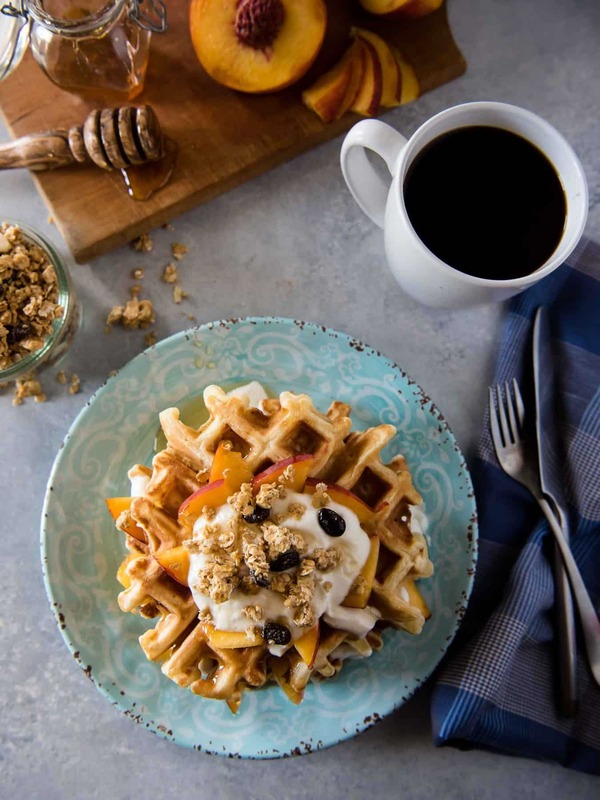 These Peach Cobbler Waffles were inspired by the abundance of summer peaches that are everywhere. I don’t know what’s going on with me this year – I normally lean more towards nectarines, but for some reason, I can’t stop reaching for the little fuzzy guys. Since The Hubs and I have gone back to the gym, we’ve also made a habit of working Greek yogurt into our mornings to keep midday cravings away. The extra protein in our oatmeal or smoothies has not only helped us stay fuller longer, it’s led to discovering new ways to use yogurt on a daily basis! These waffles came about over a weekend when he didn’t have to rush around to get ready to drive to work, and I had time to make a leisurely breakfast (something that happens a lot less than I’d like nowadays). We always grab a bunch of single serve Oikos® Nonfat Greek yogurt on our trips to Walmart, sometimes throwing a Light & Fit® in there just to try new flavors. I’ve made yogurt waffles in the past, but I couldn’t help but think that some fresh summer fruit mixed in the batter would be delicious. 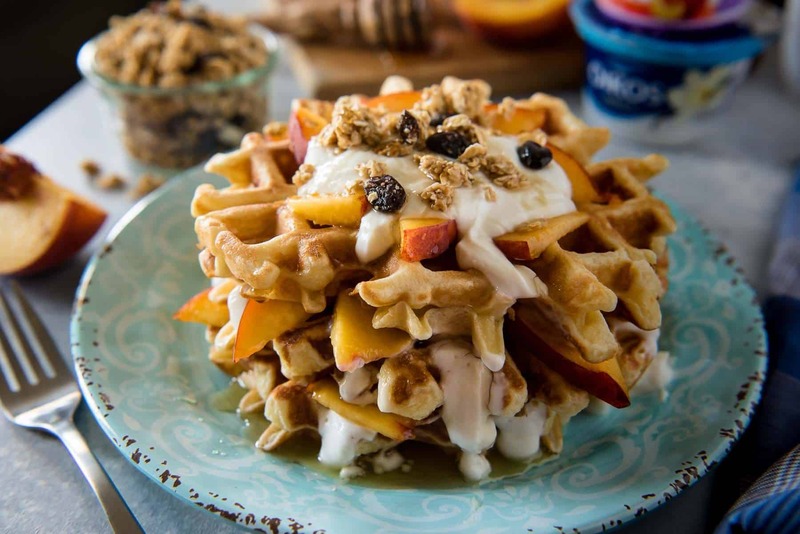 As it turns out, fresh peaches + peach yogurt = one helluva waffle. Instead of dousing the lightly sweetened finished product in sugary syrup and basically ruining the moderately healthy dose of carbs, we sandwiched them with vanilla Greek yogurt. 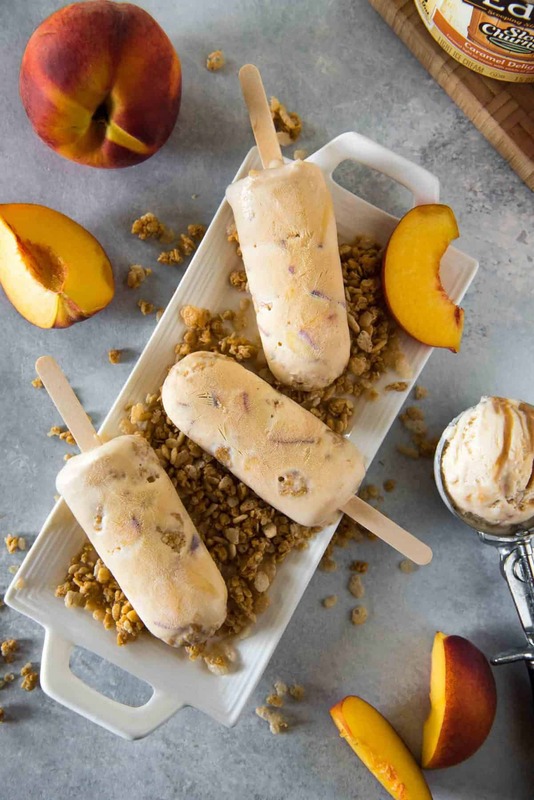 Then, we added even more fresh, thinly sliced peaches, topped it all off with more yogurt, a sprinkling of our favorite granola for some crunch, and a drizzle of local honey. We couldn’t have imagined a more filling or more delicious summer breakfast. 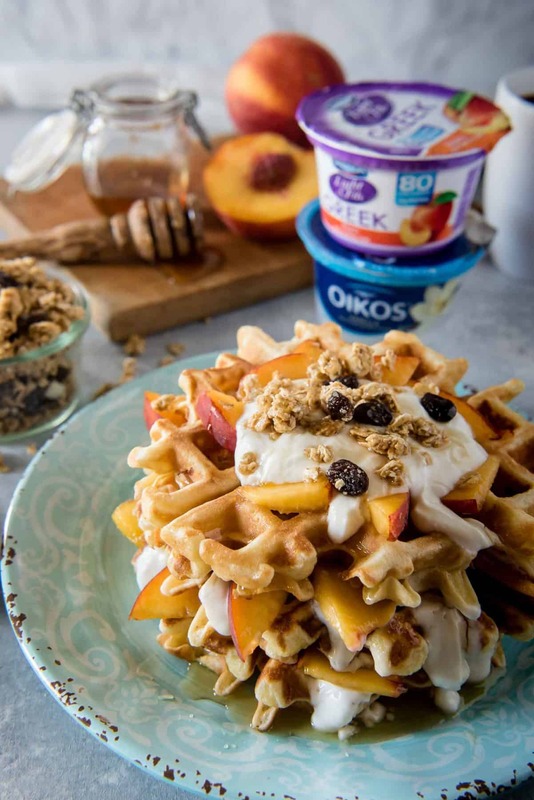 These deliciously easy Peach Cobbler Waffles with Honeyed Yogurt should be on your breakfast menu this weekend! 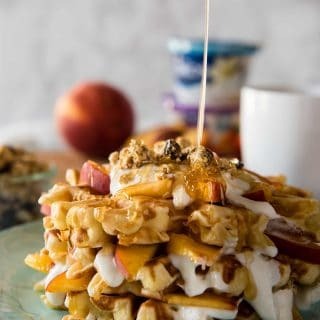 Buttermilk waffles, lightly sweetened with yogurt & fresh peaches, then stacked and topped with honeyed yogurt and granola - nothing says summer quite like these! In a large bowl, whisk together flour, sugar, baking powder, salt, and baking soda; set aside. Separate the eggs into two bowls. Whisk egg yolks together with yogurt and buttermilk, then drizzle in cooled melted butter. Fold wet ingredients and diced peaches into dry ingredients. Beat egg whites until they hold firm, glossy peaks. Fold whites into batter gently until just combined. Let batter sit 10 minutes. In a preheated waffle iron, cook 1/2 cups of batter at a time until golden and crisp. Keep cooked waffles warm in a single layer in a 200-degree oven while you use up the remaining batter. 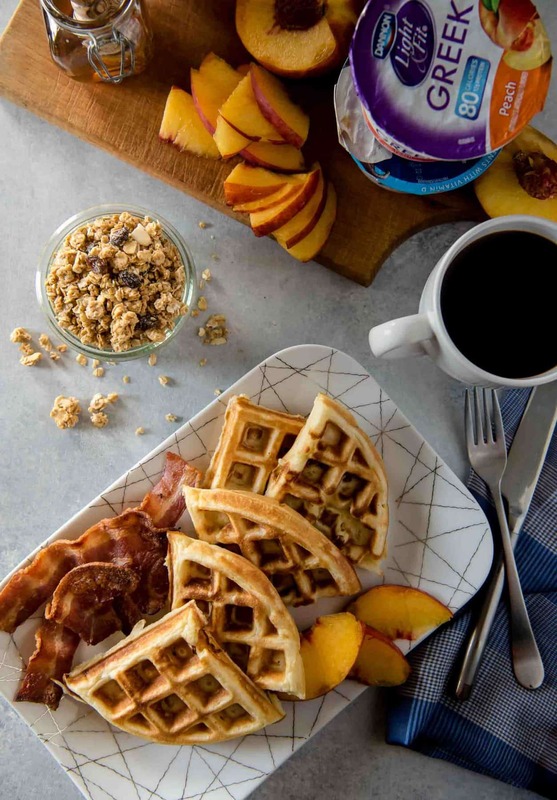 When ready to serve, layer vanilla yogurt and sliced peaches between waffles. Top with more vanilla yogurt, granola, and a drizzle of honey. Store leftover waffles in zipper bags in the refrigerator. If freezing, separate with wax paper or plastic wrap, cover with aluminum foil and store in zipper bags. Do you Ibotta? 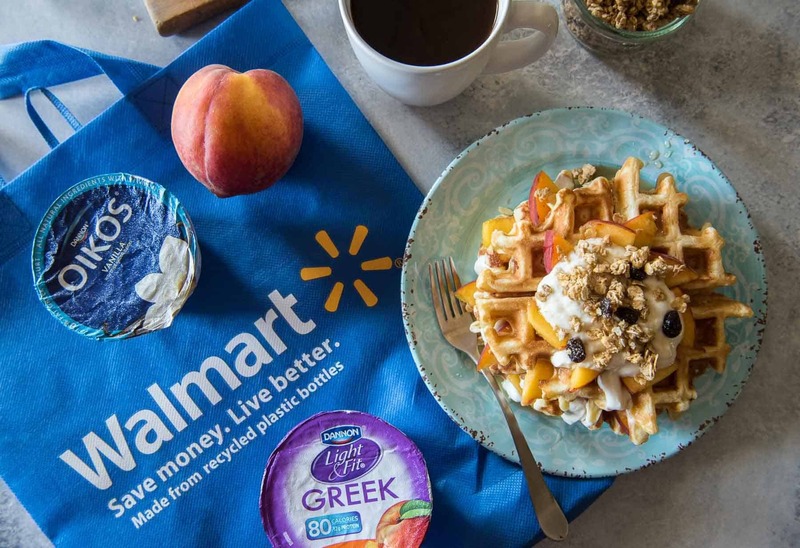 Grab this $1.00 off coupon for your next trip to Walmart! Looking for more breakfast recipes? 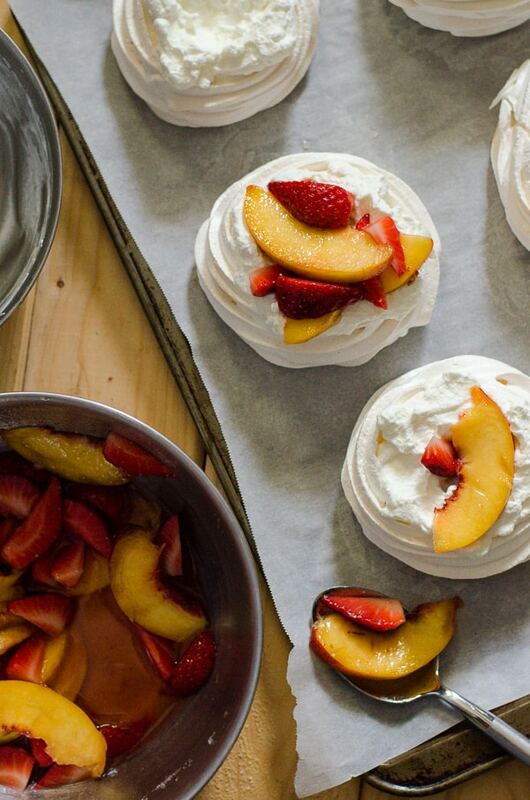 How about more recipes using peaches? Thank you, Dannon for sponsoring this post! And thank YOU for supporting the brands that make this blog possible!